1870 First trip to London. 1871 marries Julie Vellay, his mother’s maid at Croydon registry office. Live Pontoise and later in Louveciennes. They have 7 children. 1871 on return finds huge number of paintings have been destroyed. 1890s revists London, hotel room paintings. In 1903 Pissarro told his cousin Esther that he had always intended his art to be based upon the effort to “understand my sensations”. He felt that he had been able to do this “only vaguely” “around the age of forty”. "I remember that, although I was full of fervour, I didn't have the slightest inkling, even at forty, of the deeper side to the movement we were pursuing by instinct. It was in the air!" Brettell, R.R. 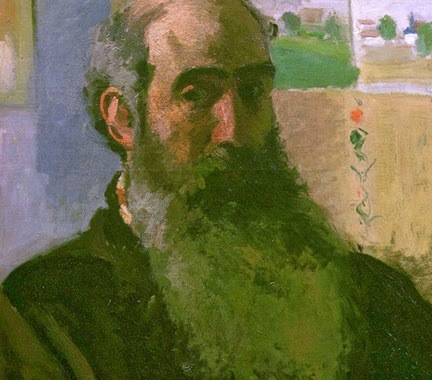 & Pissarro, C., 1981. Pissarro Camille Pissarro ; 1830 - 1903 ; Howard Gallery, London, 30.10.1980 - 11.1.1981, Grand Palais, Paris, 30.1. - 27.4.1981 ..., London: Arts Council of Great Britain. Pissarro, C., Adler, Kathleen, 2003. Pissarro in London [published to accompany an exhibition at The National Gallery, London, 14 May - 3 August 2003], London: National Gallery Company [u.a.]. Pissarro, C. et al., 2002. Camille Pissarro, letters to his son Lucien, Boston, Ma. : Artworks.